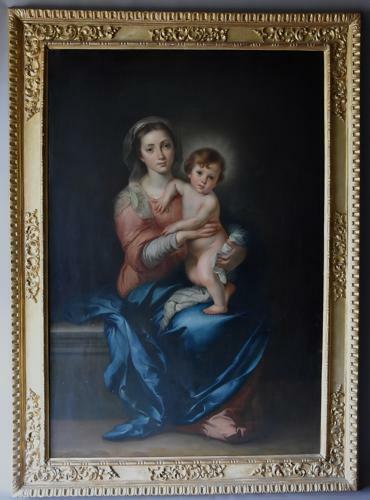 The painting depicts the seated Madonna holding her child, the canvas is in the original carved gilt wood and gesso frame and has been re-lined. The original painting by the Spanish artist Bartolome Esteban Murillo (1618-1682) is exhibited in The Pitti Palace in Florence and was painted between 1655-1660. Luigi Pompognoli was an Italian painter working in Forli, in Italy, not too far away from Florence, some of his works can be found in the museum of Forli and he painted many similar subjects - some of his works include 'Mother & Child', 'La Madonna Dei Candelbri', 'Venus & Cupid' etc. This painting is in good condition for age.